Windows 10: Best DVD Ripper for Windows 10 to Rip DVDs to MP4/AVI/WMV etc. Garner the best DVD ripper for Windows 10 to rip any (copy-protected) DVDs to MP4/AVI/WMV etc, on Windows 10 without hassle. Windows 10 had been released on July 29, 2015. Most of Windows 7/8.1 users cannot wait to free upgrade to Windows 10 for experiencing this new greatly-improved Windows operation system. But, DVD collectors involve in trouble of ripping DVDs to Windows 10 PC because of removal of Windows Media Center from Windows 10. How to make DVD ripping a reality? Third-party DVD ripping software can be a helper. Here, we want to recommend the best DVD ripper for Windows 10 to convert any DVD to MP4, AVI, WMV etc, on Windows 10 with ease. Rip and decrypt any movie DVDs to MP4/AVI/WMV/MPEG, iPhone, iPad, Android, Windows Phone, PS3/4, Xbox on Windows 10 with high quality rapidly in only 3 steps with this best DVD ripper for Windows 10 – WinX DVD Ripper Platinum. To be honest, free DVD ripping software is preferred choice to convert DVDs, for example the famed HandBrake, which is skilled at DVD to MP4/MKV/Apple/Android conversion on multi-platforms. Despite of how many users thumb up HandBrake, I should remind you to notice that HandBrake is not available to rip copy-protected DVDs and various HandBrake not working errors may bother you. 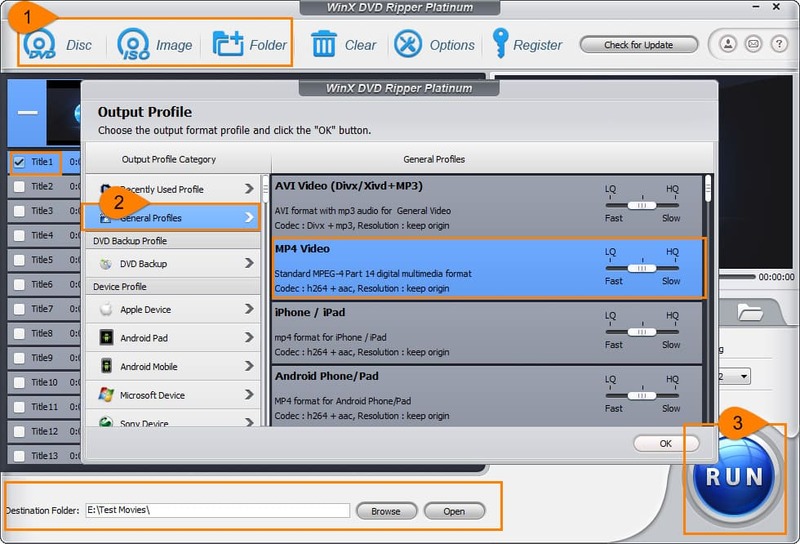 WinX DVD Ripper Platinum is specially designed for ripping DVDs, even latest copy-protected DVD movies to MP4, AVI, WMV, MPEG etc, on Windows (10/8/7/XP) as well as converting any DVDs to iPhone/iPad/Android/Windows Phone with possible highest image/audio quality for playback DVD videos on the move. Owing to Hyper-threading technology, Multi-core (up to 8) utility and the support of Hardware Acceleration (Intel QSV, Nvidia NVENC), it takes only 5 minutes (maximally) to rip a feature-length movie DVD (depending on computer configuration). In consideration of ease at use, conversion speed and output quality, WinX DVD Ripper Platinum is absolutely the best DVD ripper for Windows 10. In addition, you can customize settings to trim/crop/add subtitles for DVD video or adjust parameters (bit rate, aspect ratio, resolution, codec and more) with this best DVD ripper software for Windows 10 to have the output video played on different devices with greatest effect. Step 1. Insert DVD into DVD-ROM and launch WinX DVD Ripper Platinum. Hit DVD Disc button on navigation bar to import movie DVD. Instead, ISO image or VIDEO_TS folder can be taken as source for ripping. Step 2. A few seconds later, the complete list of DVD titles will be presented with main title checked and the output profile window pops up for you to select formats. Take to rip DVD to MP4 for example. Click General Profiles – MP4 Video. Also, you can rip DVD to Apple, Android, Micorsoft, Sony devices from device profiles category or web video formats (FLV/WebM) for YouTube, Facebook, Viemo and so on. Step 3. Set destination folder by clicking browse button and start ripping DVDs on Windows 10 by clicking RUN button. Besides, this best Windows 10 DVD Ripper allows you to copy DVD to ISO image or VIDEO_TS folder and backup main/full title to a single MPEG2 file for long-time preservation of DVD disc. • FAST rip and convert any DVD with removal of copy-protections (CSS, region code, Disney DRM and special schemes on newly-released DVD movies, workout DVD etc,) to MP4, AVI, WMV, MOV, MPEG, Windows Phone (10/8), iPhone, iPad, Android, Kindle Fire, PS3/4, Xbox etc, while keeping possible highest quality. • Copy and back up DVDs to ISO Image, VIDEO_TS folder, and MPEG2 file from main/full title at 1:1 ratio.